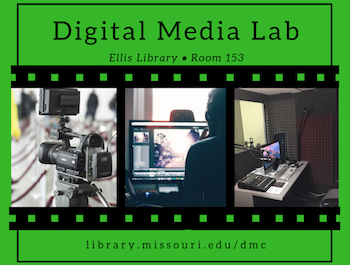 Ellis Library’s Digital Media Lab is now available for student use by appointment.The Digital Media Lab in Room 153 provides a recording booth with various software, a 3D scanner (Structure Sensor), art tablets and virtual reality goggles. The Digital Media Commons also has the film studio in 3E21. Students can request an appointment through the Digital Media Commons website at library.missouri.edu/dmc. The Digital Media Lab is open between the hours of 10 am and 3 pm, Monday through Friday. Feel free to stop by or make an appointment to see all we have to offer. Are you looking for a place to record an audio or video assignment for class? Do you have a project that requires a 3D scanner? If so, check out the Digital Media Lab located in Ellis Library, Room 156. We want to hear from you! 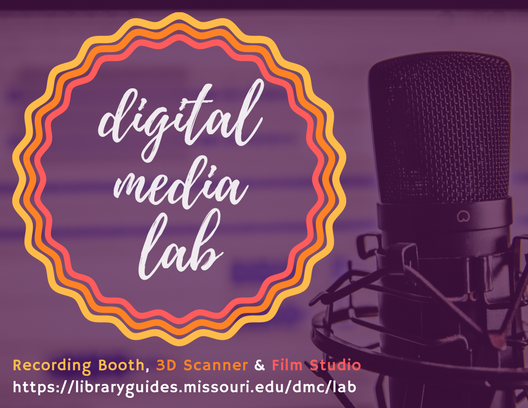 The Digital Media Lab provides a recording booth with various software; a film studio with a camera and green screen; and a 3D scanner. These resources are available to students for use by appointment. Visit https://libraryguides.missouri.edu/dmc/lab to learn more and to schedule your appointment today!